"Toledo. Within the walled city of Toledo with a view to the Vega Baja del Tajo. " 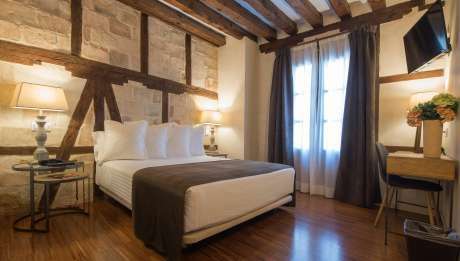 This hotel is set within the walled city of Toledo, the main building of which housed a blacksmith´s until 1815. Abad Toledo charming hotel is in a privileged setting with impressive views of the valley of the River Tagus and is surrounded by the most emblematic monuments of the city and very close to the Zocodover (main square). As is usually the case with this type of hotel the interior decor combines the original features of the building such as the wooden beams, wood and brickwork, etc. with modern, functional furniture. The guest rooms are equipped with all the modern comforts one would expect to find in a city hotel such as a safe, TV and Hi Fi system, satellite TV and air conditioning. The most special it can be to discover Toledo in a different way through guided and dramatized tours. Visits are conducted day and night to more than 150 monuments of Toledo. The hotel has a meeting room with a maximum capacity for 18 people. Enjoy from the breathtaking views to the Vega Baja del Tajo river and feel surrounded by the most important monuments of the city. En ningún momento de la reserva se nos indico que no estaríamos en el hotel,nos alojaron en un piso .